For those of you who know me, I'm not one to mince words. This is the letter I sent to the Home Depot social media person about my experience with purchasing my new LG washer/dryer from them. I sent it on December 10. I still have not heard back from anyone at Home Depot. I just got off the phone with LG. The purpose of their call was to tell me that the LG washer/dryer my husband and I purchased on Black Friday from Home Depot would not be delivered on December 15, when we were told it would be delivered. Then, the LG rep proceded to tell me they were not able to deliver it until after the first of the year. That's nearly six weeks from purchase! I understand about products not being held at the store or a nearby warehouse (although that may be something Home Depot needs to do). What I don't understand is why a big company, like Home Depot, would make such a huge customer service gamble on predicting the delivery of such a vital home appliance. My current washing machine has been on the fritz for well over a month. By the time I get this washing machine and dryer from Home Depot, I'll be on the verge of a nervous breakdown. I have four daughters ranging in age from one to 14. They change their clothes a lot. My baby poops through her clothes a lot. She also makes a lot of messes. I have a husband who likes to workout everyday. I also workout everyday. We sweat a lot. We have a lot of laundry which piles up and starts to smell. Quickly. Recently, my first grader brought home lice. Do you know what you have to do when you have someone in your house with lice? Wash everything. And I mean everything. All clothes, bedding, backpacks, coats, hats, carpets, pillows, stuffed animals, and, of course every head in your house has to be scoured with lice shampoo and needs to be scrutinized with a fine-tooth comb. All while I'm waiting for my new washer and dryer to come from Home Depot. We were all celebrating at my house last night that we have less than a week before the washer and dryer will be delivered. Then, I get this call today. I have a lot of connections. I am more than willing to copy and paste this letter into my Facebook notes and my own blog. 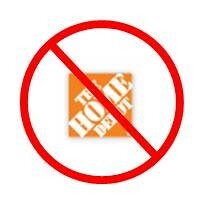 I would be happy to tell everyone out there - all the moms I know - to not purchase from Home Depot if they really need their purchase to save them from imminent household chaos. If I don't hear from someone at Home Depot, I'll start my all-out campaign to spread the word about this experience. By the way, I'm the editor of a woman's magazine with 165,00 women readers in Utah. They'll know about this, too. The person who just spent over $1200 in your store.